The preliminary TB statistics for the United States for 2016 show a total of 9,287 TB cases reported, compared with a total of 9,546 for 2,015. This is a very slight decline and a much higher rate of decline is needed if the goal of the elimination of TB in the United States is to be reached in the foreseeable future. This was a decrease in incidence from 3.0 per 100,000 to 2.0 per 100,000.
http://www.ahcmedia.com/articles/140610-tb-in-the-united-states-better-but-still-a-long-way-to-go Among the individuals for whom the information was available, 5.7% were HIV infected, 4.6% had been homeless at some point in the previous year, 1.8% resided in a long term care facility and 3.5% were confined to a correctional facility. Among the 9,287 cases of TB reported in 2016, 2,935 (31.6%) occurred among U.S. born people, and 6,307 (66.2%) TB cases were among foreign born people. So foreign born people in the United States continue to be disproportionately affected. The top five countries of origin of foreign born people with TB were Mexico, the Philippines, India, Vietnam and China. These five countries accounted for 54.9% of all cases among foreign born people. In 2015 of those people born in the U.S. 36% were Black/African American, 31% were White, and 21% Hispanic/Latino. 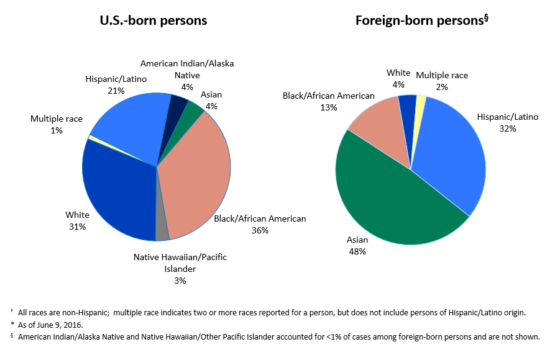 Of those people who were foreign born 48% were Asian, 32% Hispanic/Latino and 13% Black/African American. The most recent year for which information about drug resistance, that is drug susceptibility data, is available is 2015. In 2015 there were 88 cases of multidrug resistant TB. Among the 88 cases 72 occurred in people with no reported history of TB disease. This means that they were cases of transmitted or primary drug resistant TB. One case of extensively drug-resistant TB was reported. 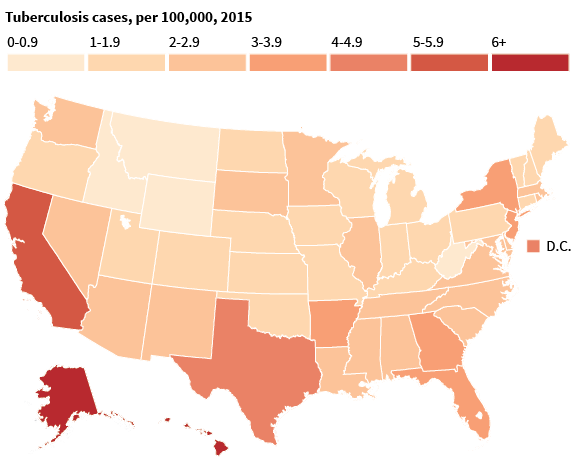 In 2015 the number of U.S. TB cases increased compared with the previous year. This was the first time since 1992 that this had happened. These figures are very different to those of the 1950s which are shown below. This is when the statistics for TB first started to be collected. The decrease in both the number of cases and deaths, is not only due to improved TB control, but also to the development of TB drugs.